Though an official announcement has yet to be made, it looks as if sparkly Edmonton electro project Purity Ring have signed on with a pair of labels -- the iconic 4AD imprint and Canadian-based business Last Gang -- for their next to-be-determined release. 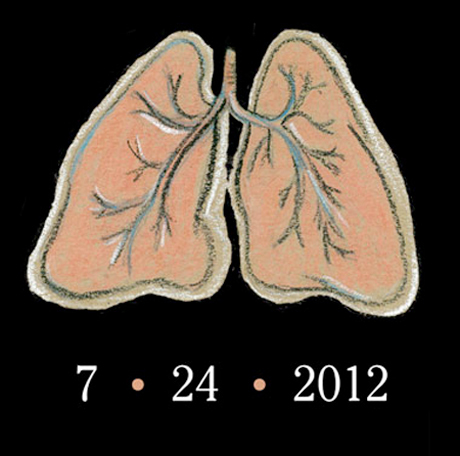 Suspicions about the business wheelings and dealings come from the duo's own website, which currently features a hand-drawn set of lungs, the date "7.24.2012" (see above), and both label logos at the bottom of the screen. Random snippets of new material, from gauzy new age instrumentals to snap beat-assisted, indie-style R&B, are also streaming on the site, so try refreshing your browser a few times. Neither label has made the news official, but we'll likely learn more about a new Purity Ring record, possibly a full-length debut, before the projected July date. Starting as a Born Gold side-project, Purity Ring had previously released a seven-inch and a split single with Braids.